Soar through the sky with our half-mile course of zip-lines at 8K Ranch! Campers get transported to our 8K Ranch where they will spend the full day with lunch provided. We are unsure if this is the longest of it’s kind in Colorado but certainly seems so. 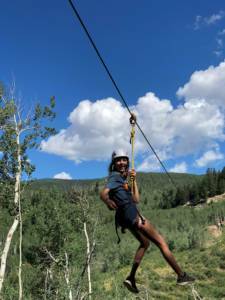 Engineers and builders have designed the zip-lines to soar past the sleepaway bunk areas, over two valleys, and through an Aspen forest before coming to a gentle stop a half mile later. You only need to be brave to step off of the launch platform – after that, gravity does all the work! Please note: Because this activity is located at 8K Ranch, the home of Ajax Sleepaway, sleepaway campers will have this activity offered nearly every day at camp. For day camp this full-day activity is provided twice per week. We ask that you, please reserve a space online for Zip/Slip day if you would like to participate as part of day camp.